The LED is white. The resistor in the bottom right hand corner that's covered by the electrolytic looks like brown-red-black-black-brown. It's very similiar to Pale green or Green forest compressor + Release and attack control. I've numbered the components and tracked some connections. Enybody have some more gutshots ? Ok - i've done some progress but still I have some missing connections. Sustain pot - is coneccted somehow with R7 and C10. I don't know if that it is correct to connect bias directly to pin 5 of IC1B(+input). I don't know where the signal goes to IC1B(opa2134). R10 and R3 are in series with the cap C9 ? This make no sense. Feedback from Q1 by C8 and R2 to the tone pot ? Release pot +R1 to the VA? D5 diode in reverse order? Does anyone have this device? I need a photo or two to finish it. Nice job, this comp sounds great in demos...lots of control. great work, only a matter of time filling out the details. Some corrections to the Sustain pot. R15 and R16(bias) seems to be wrong:/ 2kOhm from 18V makes 10mA current. This is almost max from LTC1044 you can get. I've just build this on bread board and i have voltage drop down from 15 to 12 V after i connected R15 and R16. This two resistors should be 10k at least(0,9mA current). Besides - i still don't understand why use a voltage divider for bias - you can get a symmetrical +9 and -9V from LTC1044 and use a GND for bias. daimondamps wrote: R15 and R16(bias) seems to be wrong:/ 2kOhm from 18V makes 10mA current. This is almost max from LTC1044 you can get. That, and the 9V regulator really shouldn't work with a 9V supply. I have used 10k resistors and charge pump now is working(for now i build only envelope section). 9V reg like 78L09 have" Minimum Value of Input Voltage Required to Maintain Line Regulation = 6,7V" so it will work even with low voltage. This stomp-box have no battery option. I think they want to secure the components from over-voltage by using 9V reg. No, that's the 78L05. The 78L09 requires 10.7V. No traditional regulator regulates up, and only low dropout voltage regulators would be able to output 9V from 9.6V supplied by most wall warts. EDIT: Th regulator input is clearly connected to pin 1/8 of the charge pump. I'd guess it's a 78L05 based on my trace of the PGC. mmolteratx wrote: No, that's the 78L05. The 78L09 requires 10.7V. No traditional regulator regulates up, and only low dropout voltage regulators would be able to output 9V from 9.6V supplied by most wall warts. EDIT: Th regulator input is clearly connected to pin 1/8 of the charge pump. I'd guess it's a 78L05 based on my trace of the PGC. Yes - sorry my mistake about the voltage. A standard regulated 9-volt DC power supply with a negative center 2.1mm barrel, no battery option. The Warden internally boosts the voltage up to 18v, do not run at higher voltages! Current draw is around 20ma. We recommend and use Voodoo labs PP+ power supplies." From my trace the regulator output is conected to the pin 1 and 8 of ltc1044. I treaced this several times. Look at the data sheet for the 78L0x series. Pin 3 is input, not output. EDIT: Doh, I just realized he didn't label what it is in the pictures, the 78L is from your schem. It may be correct then, but it's a different regulator. mmolteratx wrote: Look at the data sheet for the 78L0x series. Pin 3 is input, not output. You are right - it's have a different topology. 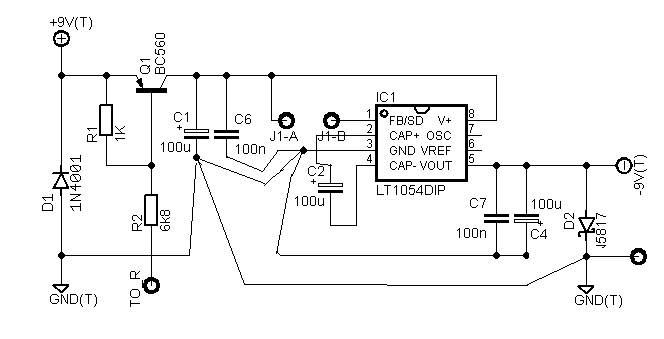 I start to thinking that this may be a PNP transistor to protect LTC1044 against ESD. Something like polarity protection or power conditioning could it be? micromegas wrote: Something like polarity protection or power conditioning could it be? it's posiible but I don't see any diode in series to the to-92 component. So my conclusion is - we dont know what is the TO-92 thing so I recommended to put Zener diode (9,1V) in there with resistor 100R . This will protect LTC1044 from over-voltage and ESD spikes. I've build this circuit on bread board and it's working:) The hardest part is to chose correct Optocoupler (LDR). I put there Silonex NS-32 SR3. Basically compressor is working but maybe need some tweaking with component values. Attack control is working ok- but smallest attack time depends on the optocoupler ON reaction time. Ratio - is working - but regulation depends highly on used LDR. Ps - sustain pot is back to the first place in negative feedback loop- when it was in series R7 it was changing the tone with series with C10 . R14 is used to tweak gain and sustain to the mounted optocoupler. So this is my build and schematic.